Horse Fencing, Horse Stalls, Farm and Barn Equipment. From the time I was 5 years old, horses have been my passion. I was the little girl that begged for a horse while sitting in front of the TV watching all the Westerns back in the day. My first horse was purchased from Pearson Park, where horses were ‘rented’ to ride. He was a kind horse with a hard mouth and a bad barn storming habit. I soon learned, after a sore head and knees, tucking and laying down on his neck helped to avoid bumps and bruises from any open doors at neighboring farms. Learning how to ride this barn stormer bare back taught me great balance. Lack of money for a saddle was actually a blessing in disguise. So I rode many horses for many years…My experiences with horses include a wide range of disciplines, Western riding then a big switch to English hunter/jumpers with a good dose of driving. I boarded horses, many horses and gave beginning to intermediate riding lessons. Life with horses was good. There were not too many horses that I felt I could not ride through most bad habits in hand or on the ground. Put me on that horse and I would go. We eventually found property fit for our dream barn. Plans and scrolled architectural drawings were piling upon the kitchen counter until we decided we had the perfect layout for our barn. Soon dirt was being moved, building materials arrived and up went the barn. Better than I could imagine, we had our barn, our horses and property to ride around. Not long after the barn was built I started feeling sick and doctors were unable to diagnose what was wrong. I soon found myself in and out of hospitals to no avail. Slowly, I found I did not have the energy to ride like I used to and for about a three year period, I was unable to do the normal things in the barn or ride. Just getting well was the goal and it took time. Although I began to heal, I needed people to help with my barn and horses. I found that I wanted to try to ride, but did not feel confident because of being weak. I would brush the horses and return them to their stall or pasture. Going very slow, I could only hope that I would be able ride at a walk soon. Getting back in the saddle was slow. And after being sick for a time I found that my stamina was not at all what it used to be. I not only lost muscle to sit confidently on my horse, but I also lost my breath! I could not trot for any length of time before I was completely winded. My confidence waned and my thoughts of having a good ride were memories rather than daily events. I became a secret worrier, concerned that I would not be able to do what I once did. And the thought of telling anyone about my fears would have been more like death rather than just being truthful. So for a few years I would brush my horse, longe and barely ride wondering what was going on with me. I began to read some of the horse forums and found out that I was not ‘the only one’. Riders that have ridden and then for many different reasons take a few years or more off, find themselves lost and unable to confidently ride again. And we have a name, we are termed Re-riders! Any age, discipline or level of riding combined with an amount of time off can throw us into a Re-rider tail spin when we decide to get back to riding. Often it’s people that rode when they were young, took a break and then decide to come back to their horses. Perhaps the rider has returned to horses at an older age no longer having the physical strength they once had or the realization that fast reactionary time has decreased and fear or anxiety sets in. Confidence is lost and embarrassment follows leaving the rider disempowered and unable to do even the simplest aspects of riding – just getting on, moving from the walk to the trot, or riding outside of an indoor arena. The anxieties are varied and almost debilitating to the rider. The good news is – these fears or weaknesses can be overcome. The first step is to be able to understand that anyone, any age, could become a Re-rider. Then with the help of an understanding instructor, horse friend or a support person, you pace yourself and work back into confidence. Having a safe horse is key to eliminating any further negative experiences. Also, consistency with riding on a regular basis keeps confidence in check over time. Finding a schooling barn with good seasoned horses, (even though your horse may be at your own home barn) and setting up a few lessons could be all that is needed. Having the lesson back-up may be just what you need to keep riding confidently, when once you rode alone. It just helps knowing you have support riders around you and a plan with goals to get back in the saddle. I have been riding at a barn where experienced riding friends are there if I need to call on them. They have gently yet actively nudged me back to doing the riding I want to do once again. Since I have horses at home too, I have a friend that will ride with me on nearby trails – so I get both the indoor experience of schooling and the outdoor ride that fulfills my horses and myself even further. My goal – to jump something more than just small oxers again. And I know I will do it! If you think you are a Re-rider, don’t be ashamed to talk with someone you know that will listen to your experience. Talk out a plan to move forward with their help and a good, quiet horse. Before you know it, you will be having all those fun experiences again, just like you remember! If you would like to share your experience with others, feel free to email me directly at debbie@rammfence.com. Debbie Disbrow, owner of RAMM Stalls and Horse Fencing, has over 45 years experience with horses and equine-related businesses. She is a certified fence installer and has helped build fencing and stalls for horse facility owners across the USA as well as into Europe. Debbie is highly involved in horse ownership and riding. Visit her web site at www.rammfence.com,, or call 1-800-878-5644 for safer alternatives for your horses. Karen Elizabeth Baril and Debbie Disbrow teamed up to bring you this article. While it’s always best to check the weather forecast before you travel with horses, sometimes driving in bad weather can’t be helped. A sudden storm crops up while we’re on the road, or we need to get a sick or injured horse to the clinic, or worse—we’ve been asked to evacuate. Depending on how well prepared we are for the challenge; it can be an exciting adventure story or a real disaster. One of the first things a trucker learns in school is how to safely pack a load. It’s simple physics; heavy stuff down low on the bottom, light-weight things on top. Secure the load with ropes or harnesses to prevent objects from shifting which could mean loss of control of the vehicle. Hmm….you see the problem. The unfortunate fact is that horses are built top-heavy and unless we load them upside down, we already have to break the first rule. Worse yet, horses are a dynamic, constantly moving load, impossible to fully secure. You now have a challenge that most professional truckers never have to face. Like all things in life; preparation is key. The most important action you can take is to know your rig’s capacity for towing. Even a small trip downhill is a challenge if the weight of the load exceeds the capacity of the tow vehicle. 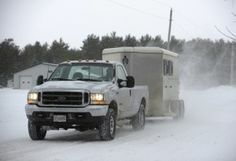 In that scenario, the load (the weight of your horses, trailer, and equipment) drives the vehicle, a very frightening and potentially dangerous event, especially if the roads are slick. You already know that your truck has a maximum rate for towing, but this is also true of your hitch, ball, ball mount, and safety chain. Concentrating strictly on the truck is missing at least half of the equation. All hitches come with a class rating as well as a weight rating. For example, a Class 1 hitch has a 250lb tongue weight and generally speaking, a 2500lb.fully loaded weight or Gross Trailer Weight (GTW) limit. All bumper pulls must have a Class III or Class IV Hitch bolted or welded to the frame of the vehicle. All hitches are not created equal despite the class rating. The total GTW of your hitch will depend on installation techniques and construction of the tow vehicle, not to mention the ball mount and safety chain. Get professional equine advice when in doubt. Don’t rely on your vehicle salesman to give you the right information. Check your Gross Vehicle Weight (GVW) on any highway vehicle scale just to be sure you are hauling within your limits. Make sure you weigh a full load, including horses, tack, hay, and equipment. Before you load up do some pre-flight checks, especially if your trailer has been sitting for a while. Look over your hitch and check the tire pressure on both your truck and trailer. Blow-outs are one of the most common causes of towing accidents and one of the easiest to avoid. If you live in a cold-weather climate, invest in winter wipers (little rubber sleeves) to prevent ice from building on the blades, but take them off in the good weather. Winter wipers are heavy and tend to wear out the wiper motor. Check and replenish engine fluids, including wiper wash. Adjust your telescoping mirrors to avoid blind spots. Remove all snow and ice from truck and trailer before venturing out on the roads. Pay attention to headlights, brake lights, indicator lights, and reflectors. Clear snow and ice from the windshield, but also from the roof. Ice that suddenly slides off the roof can cause an accident or spook your horses. When roads are slick, drive slower than the speed limits allow. Go easy on the brakes. Downshift to a lower gear when traveling up or down steep grades and never park on a grade in bad weather. Don’t feel pressured by other drivers. Ignore them. Your goal is to get your horses to their destination safely. Turbulence from another passing vehicle may cause your bumper-pull to sway. To avoid sway, keep tension on the hitch. A trailer that begins to sway is heading towards disaster. Truckers call this “the tail wagging the dog”. If you feel your bumper-pull sway, keep your steering wheel steady and don’t use your truck brakes. Apply your hand brakes carefully; usually short bursts are most effective. This will slow the trailer behind you and help to stabilize the motion. In a jackknife situation, the trailer brakes have locked up, causing the trailer to drive the vehicle. A jackknife is more likely to occur in bad weather, but can occur even in good weather at speeds as low as 5mph depending on the size of the load. If you feel your trailer sway or feel the hand brake has locked up, don’t apply your truck brakes. Instead, you’ll want to drive forward, if possible, gaining enough speed to regain control of the vehicle and regain traction on the road. Using the hand brake is useless and using your truck brakes will make things worse. Sway bars help prevent jackknifing and are a must, but even the sway bars are not a guarantee against a jackknife. Knowing what to do when it happens is critical. Hydroplaning occurs when the tread on your tires cannot channel water away from the tire fast enough to create traction. This lifts the tire off the surface of the road and all traction is lost. In a hydroplane, remove your foot from the accelerator slowly. Don’t touch the brakes. Avoid all fast moves. Prevent hydroplaning by making sure your tires are in good condition and by driving slow on wet roads. Driving in the tracks of the vehicle in front of you helps as well, as some of the water will already be displaced. 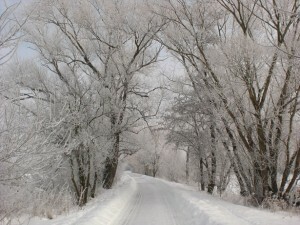 Winter driving does present special challenges, but learning how to drive defensively will help you and your precious cargo arrive at your destination safely. A well-planned fence layout is not only beautiful and easy to maintain, but it’s also a real step-saver when doing barn chores. If you skip or underestimate the fence planning stage, you might regret it later on when struggling to drive your tractor through a too narrow gate or having to walk too far to get to the turnout paddocks. Whether you’re planning from the ground up or fine-tuning an existing layout, the following tips will help you create a fence layout that works for you and your horses. It was Benjamin Franklin who said, “By failing to prepare, you are preparing to fail.” I’m pretty sure he wasn’t referring to fence layouts, but it’s an adage that fits. Your first step is to draw your proposed layout (to scale) on paper first. There are many software programs that can help with the design process, although you might have to tweak them a little for the farm environment. As you design your layout, include existing buildings like your barn, hay-shed, or home, and topographical features like streams, ponds, or shade trees. Here are a few basic guidelines to keep in mind as you sketch your layout and choose your fencing material. Keep sacrifice and turnout paddocks closest to the barn to save you steps. Grass fields can be a little farther away from the barn. Choose a High Impact Flex Fencing to separate fields or other highly visible and safe product. Consider the gender, size, number, and temperament of the horses you’re fencing in. Stallions, mares, foals, and miniature horses all require special consideration. Double fencing or lanes between paddocks will prevent neighboring horses from socializing over the fence-line. High-traffic areas, like those closest to the barn, around water troughs, feeding areas, gates, and adjacent fencing need to be sturdy enough to withstand horses pushing or testing the fence. Electric shock tape or coated electric wire is a good back-up deterrent. Keep horses off fragile areas like streams, ponds, and delicate tree root systems with electric shock tape or coated electric wire. Use electric polytape or electric shock tape fencing as a permanent fence and as a temporary fence for rotational grazing systems. Consider installing a perimeter fence if you can afford to do so. 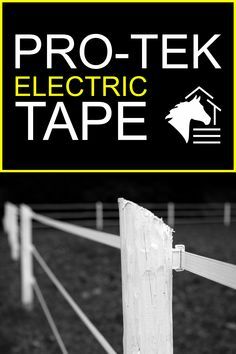 Should a horse escape his paddock, perimeter fencing ensures he won’t reach the road; a 1.5 inch electric shock tape works well as a perimeter fence or alternatively an electric polywire fence. Both are economical and easy to install. No matter what style or material you choose, your fence construction must meet a few basic criteria. It must be sturdy enough to withstand even the most playful or grass-greedy horse and must be free of anything that could trap or snag a hoof or a curious nose. Never try to save money by purchasing fence made for other livestock. When it comes to fencing, the cheapest alternative is often the one that can lead to heartache down the road. Remain flexible when it comes to style—many farm owners combine two fence styles depending on the intended use. For example, around paddocks or grass fields, you might choose a High-Impact Flex Fence as a top rail and use a coated wire fence for the remaining two or three rails. This offers you an aesthetically pleasing look, but is fairly easy on the budget. If predators or loose dogs are a problem, consider V-Mesh Fencing to prevent them from getting into the paddock. When fencing in a large, grassy field where horses will spend their days happily grazing, consider electric tape fencing (highly visible) or coated wire fencing. All fencing should offer a strong deterrent to any horse that tests it, but should also offer forgiveness. We love High Impact Flex Fencing for this reason. Although it does yield 6-12 inches on impact, it flexes back into its original shape with no damage to the fence or your horse! Low maintenance makes this a winner in our book. Electric tape fencing is highly visible and therefore is a good choice for rotational grazing. In a rotational grazing system, you might change the configuration of your pasture weekly. If horses can clearly see the new fence, they’ll have no trouble learning their new boundaries. Generally speaking, the closer the gates are to the barn, the less time it will take to turn horses out. 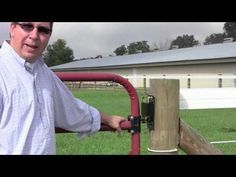 For paddocks or fields divided by an all-weather lane, install parallel gates roughly half-way up the fence line to make for easy transfer of horses from one paddock to another. Equine access gates should always be positioned several feet away from corners. This will prevent dominant horses from trapping a submissive herd buddy in the corner. Better yet, avoid corners altogether by designing paddocks with round or oval shapes. Install 6-8 foot gates for horse and human traffic, 12-16 feet for vehicular traffic. Be sure to allow for adequate turnaround if the gate is meant to be used for tractors. Add a gate wheel on gates 8-feet wide or wider to ensure the gate won’t sag. One or two-way locking latches make handling gates with one hand a breeze. Perhaps the most important tip we can share is to encourage you to buy your fence from a reputable company that cares about the safety and well-being of your horses. At RAMM Stalls & Horse Fencing, we care about you and your horses. All of our products are extensively field tested. If we wouldn’t use it in our own barn, we won’t sell it. This month, check out our lineup of fencing at www.rammfence.com. As always our friendly staff is ready to answer your questions at 1-800-434-8456. Give us a call! Spring showers that left us with puddles of mud in our pastures, are turning lush and green. That’s when I know its high time to get busy and evaluate my horses pastures, fence lines, gates, water areas and out-door sheds. Here are a few tips and ideas to help you save both money and time by maintaining your pasture areas now. Walk or ride your fence lines and look for any repairs. After seeing many accidents that could have been avoided, this takes the number one slot for frequent evaluations. Our horses spend most of their time in their pastures. It is basically their home and far too often over looked. Without safe fencing we risk accidents that could have been prevented. Not to mention, the cost of vet bills and not taking care of our best and largest investment – our horses and their well-being. Ride or walk you fence lines and look for any protruding nails, screws, or unsecured rails. If you have wood fencing, be very sure all rails meet end to end and that they have not warped. Boards that do not line up flat can potentially injure and cut your horse. If you have rigid PVC fencing, be sure that all rails are fully secured into the post routings and that your secondary electric fencing is working to full capacity. Take a notebook along with you as you walk your lines and jot down notes of what material you may need to do any repairs. Also take a versatile pair or fence pliers and ring shank nails for quick repairs, if needed. Tie bright plastic tape or string at repair spots. This will help to save time when you return to do repairs. If you see any high traffic areas where your horses are starting to push or lean on your fence, take measures to stop the abuse. Cut brush and trees away from your fence lines so that horses will not be tempted to lean over your fence. If your horses are eating under your bottom rail to get grass, consider adding electric and giving additional grass hay in your pasture to prevent this from occurring again in the future. Is your pasture holding up to regular use? Do you have trouble maintaining your pasture grass? If so, you may want to consider cross fencing and use one area as a dry lot while allowing the other area to rest. Damp wet ground can become rutted and torn from happy horses. Cross fencing allowing rotational grazing, and can help to save your needed pastures. Additionally, by rotating you can knock down manure piles and help to prevent parasite problems in the resting pasture. If possible, the best option may be to add an additional pasture with an aisle in-between. Aisles help to eliminate the wear on and over common fence lines (cross fencing), and keeps your fences lasting longer. Check your gatesWeather changes such as heat, as well as frost and thaw have a relentless way of “moving” some of our most leveled gates! Additionally, horses can do a lot of gathering and leaning at gates. 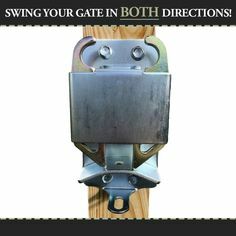 After some amount of time or wear, gates must be re-leveled and checked to be sure that spaces between gate or latch posts are no more than 3 inches. Larger spacing could be potentially dangerous places for ponies and horses. Accidents can occur when a horse pushes their heads or legs through the space between the latch post and gate. When the horse pulls back, the gate pulls back to, catching the horse without a way out. 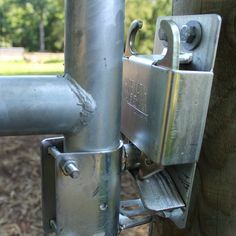 Fortunately, you can avoid injury by checking your gate areas to make sure your posts are set straight with proper latch spacing. Adjust “J” bolts at gate hinges for proper spacing also. Also make sure that the long end of the bolt does not protrude too far out on the opposite side of the post. If does, consider cutting the bolt shorter. Use washers and a nut to cover the remaining end of the J-bolt. Chain closures can create movement with your gate if not snug around your latch post. A good alternative is to install a two-way locking gate latch that keeps the gate from moving. Additionally, these latches have a ‘no sag’ feature that holds your gates straight. If your walkways to and from your gates are worn and tracked down from use, consider using stone screenings on walk areas. The fine screenings compact more than fill dirt and will allow rain and water to drain, helping to eliminate puddles and mud – which is so much nicer during turn out. Water is one of the most important things that you horse consumes. If you have metal water troughs, check for rusted and/or dented areas that can lead to slow leaks or loss of water for your horses. Also, look over plastic tubs for cracking. Automatic waterers should also be checked frequently for proper filling. All water containers should be cleaned, bleached and rinsed thoroughly on a regular basis. If your horses like to play in your water troughs, consider using fine stone screenings under and around your watering area, this will help to eliminate standing water, puddles and bug activity. If your hoses are outside all or most of the time, it’s important to have an area where they can get out of inclement weather – wind, snow and sun. A 3-sided shed provides a place for horses to get relief form the weather. Be sure to check existing sheds for any areas of abuse. Split wood, broken pipe, or broken siding can be places that an accident can occur. If your horses have “nested” on the dirt floor and made large impressions in the ground, refill those areas with dirt and consider using some sawdust, straw or stall mats in nap areas. It will be more comfortable inside the shed for your horse, and will help to avoid open spaces under the frame of the shed. 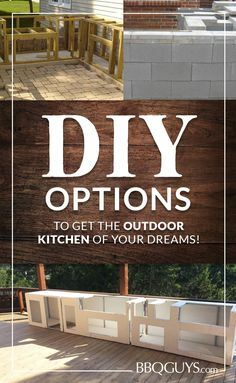 Be sure, especially in windy areas, that you anchor your shed and that the back of it faces the prevailing wind direction. Make your horses living areas the safest that you can! Be ready to spend time with your horse early in the season by getting pasture area maintenance completed now.